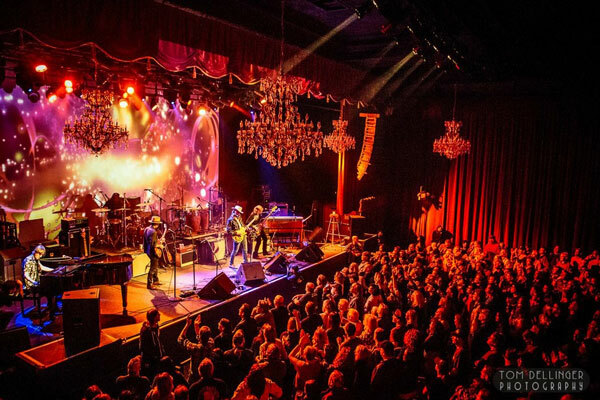 Devon Allman, singer/songwriter/guitarist and son of Gregg Allman, debuted his new band, The Devon Allman Project, at The Fillmore in San Francisco, CA on Friday night. The evening was a double celebration as it was also the birthday of the late Gregg Allman. Following the opening performance from Duane Betts, son of original ABB guitarist/singer/songwriter Dickey Betts, the Devon Allman Project took the stage for the headlining set. From there, the show continued for the “special guests” portion of the evening, with bassist Berry Oakley Jr., son of original ABB bassist Berry Oakley, Cody Dickinson (North Mississippi Allstars), and keyboardist Peter Levin (Gregg Allman Band) holding it down with the core band. Luther Dickinson (North Mississippi Allstars), Robert Randolph, Jimmy Hall (Wet Willie, Jeff Beck, Hank Williams Jr.), Brooklyn Allman, G. Love, Ben Sparaco, Alex Orbison, and Johnny Stachela all traded places throughout the evening, playing through several Allman Brothers Band classics. On this night at the Roxy Theatre, the guitar was king. 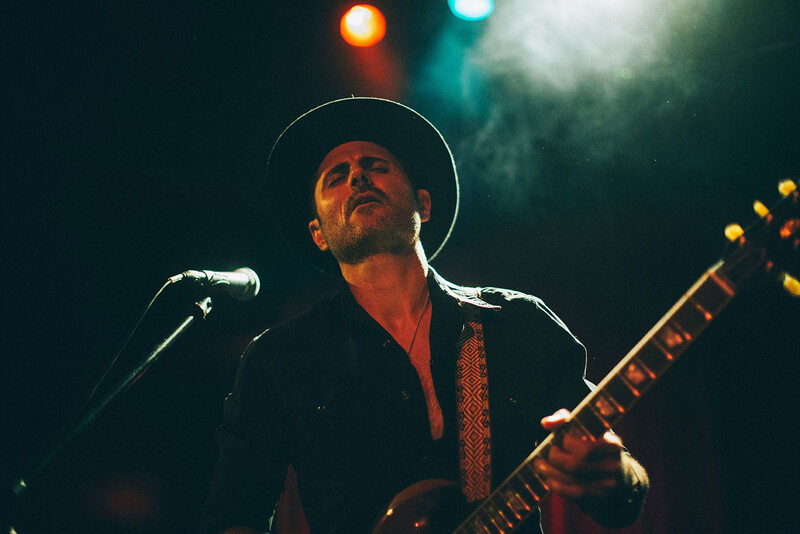 The six-string summit began early at the famous Sunset Strip venue; the house still filling in as Duane Betts and his Pistoleers took the stage a few minutes past eight o’clock. Tearing into the Rolling Stones nugget, “Silver Train,” Betts and his fellow axe man Johnny Stachela established the proverbial and literal tone right from the drop; blistering guitars and cranked-up amps. Plenty of jams rumbled through the half-hour set, with Stachela shining on slide and Betts driving sweetly melodic through his original “Taking Time,” then as the two paired up for a beautiful rendition of Betts’ father Dickey’s “Blue Sky.” Yet, this was but the thunder before the lightning. The curtain parted on the North Mississippi Allstars with just the sibling duo of Luther and Cody Dickinson, on guitar and drums respectively, onstage. Luther, working both fretboard and keyboard through a crunching opener that left him with a broken string, seemed positively possessed by the spirit. Johnny Stachela and perseverance know each other very well. They would have to for the Panorama City, Calif., native to grow up in the San Fernando Valley and emerge a success. In the shadow of the Sunset Strip, mere miles from the heartbeat of the music industry, Stachela was surrounded; circled by the aspirations of every new guitar player fresh off the bus from Anywhere, USA, and the cynicism of the defeated, languishing in day jobs after the stage lights went dark on their dreams. Love it or leave it, Stachela was bounded by dreams and defeats. Music began as a curiosity, then became everything. As a toddler, he delighted in spreading out his father’s AC/DC vinyl on the floor, wielding an air guitar, imagining Angus Young. At 12, he was gifted his first electric- a Kramer Striker- and learned the licks of the late-‘80s echelon of rock like Van Halen and Guns N’ Roses. This was the zenith of hair metal and these were the local-boys-made-good. But, Stachela felt drawn to an older muse, one originating decades before and thousands of miles away. He prized heavy metal progenitors Led Zeppelin, Black Sabbath, and AC/DC, but he dug into the core of those bands and found something deeper, more affecting. He watched a middling, ‘80s movie, Crossroads- the tale of a young guitarist in search of a lost song. Inspired by the Ry Cooder soundtrack, and a storyline echoing Robert Johnson’s mythological deal with the devil, Stachela found the blues. Stachela devoured it all; turned on to the three Kings- B.B., Albert, and Freddie- and their post-war electric blues brethren, Muddy Waters, Howlin’ Wolf, and Elmore James. He played blues gigs around the city- a somewhat antiquated notion in ‘90s L.A.- and found a wellspring of inspiration in the descendant shapers of the genre from the American South like The Allman Brothers Band and Lynyrd Skynyrd. He had the energy, the desire, and the determination, but the results were more a trickle than a torrent. There were some “moments,” some firsts, no doubt, as he consistently gained respect as a guitarist, like recording and touring with Leroy Powell (Shooter Jennings, Sturgill Simpson). Still, the Cal State Northridge grad felt a little lost, at his own crossroads. 9-to-5 and “After Midnight” couldn’t co-exist much longer. In the early 2010s, Stachela cut ties with the shirt-and-tie world. He added his singing voice to his arsenal, and by mid-decade, he’d cultivated a working relationship with Gov’t Mule bassist Jorgen Carlsson- recording at Carlsson’s studio a 2015 solo EP debut, Walk Through Fire, then enlisting him as a producer on the next year’s follow-up, Handle It, from his Johnny Stachela Band. 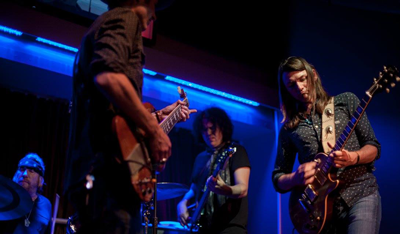 The group held a year-long residency at the venerable Santa Monica blues club, Harvelles, sharing sets with longtime friend, guitarist and singer Duane Betts. 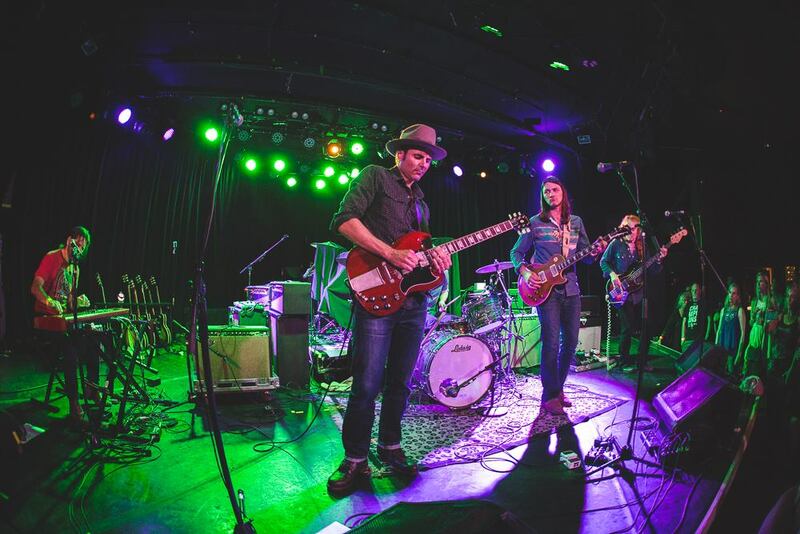 By 2017, Duane Betts and the Pistoleers materialized out of an oft-discussed desire to form a band. Stachela’s career to that point held its share of heady experiences. He’d recorded with Grammy Award-winning producer Eddie Kramer (Jimi Hendrix, Led Zeppelin), and warmed up stages for guitar legends like Duane’s father, Dickey Betts, as well as Robbie Krieger, and Mike Campbell, among others. This was different. This was the music he wanted to play, with a friend and talent he respected, and a history he revered. This was the dream. With Carlsson and Gov’t Mule’s drummer Matt Abts, Stachela and Betts performed a one-off, July 4th weekend show on the Santa Monica Pier as Bando. They played sold-out shows with North Mississippi Allstars at the Roxy in Hollywood and an opening set for Devon Allman Project at the Fillmore in San Francisco. In 2018, Stachela and Betts partnered with the Devon Allman Project as guests, supporting and sitting-in on a nine-month Allman/Betts World Tour, with stops at such iconic venues as the Beacon Theatre in New York City, Tipitina’s in New Orleans, and Colorado’s Red Rocks amphitheater. The European leg saw Stachela in Spain, Belgium, Netherlands, UK and Germany. Additionally, he performed on the second single, “Downtown Runaround,” and subsequent video from Bett’s debut EP, Sketches of American Music. Stachela recorded a session at the famed Muscle Shoals studio in late 2018 for what would become the debut album of the newly formed Allman Betts Band, with a world tour and record’s release set for spring of 2019. Brandishing his Gibson SG- a trademark of the late Allman Brothers Band guitarist Duane Allman- and a Fender amp tracing its lineage back to Bonnie Raitt, Stachela has found that magical tonal connection between the celebrated legacy of the past and his pursuit of modern blues. His bottleneck slide work has evoked favorable comparisons to his heroes, influenced and inspired, never imitating. And as 2019 promises to be even more eventful, the well-earned pay-off for Johnny Stachela and his 20 years of perseverance is just beginning.